This past weekend I made a trip to Vadodara formerly known as Baroda to meet my friend, tangy lemon. As I boarded the flight; business men were making last-minute calls, closing deals and making preparations for their weekend. This is a good time to visit Vadodara where Navratri is celebrated with great furor. Navratri which literally means nine nights is a festival celebrated for nine days and nights at the beginning of autumn which is considered to be a sacred time. During the festival Goddess Durga is celebrated for her embodiment of the creative feminine force. As I reached my friend’s house I was treated to a homemade Gujarati lunch consisting of two sabzi’s(vegetable stir fry of cauliflower, potatoes and peas), rotis (flatbread), some Kadhi (curd based curry), rice and Aamras(mango pulp). The meal was wholesome and delicious. Later that afternoon we visited the campus of Maharaja Sayajirao University, the largest university in the state of Gujarat offering programs in the fields of fine arts, performance arts, education, psychology, law, community science, management, economics and social work. 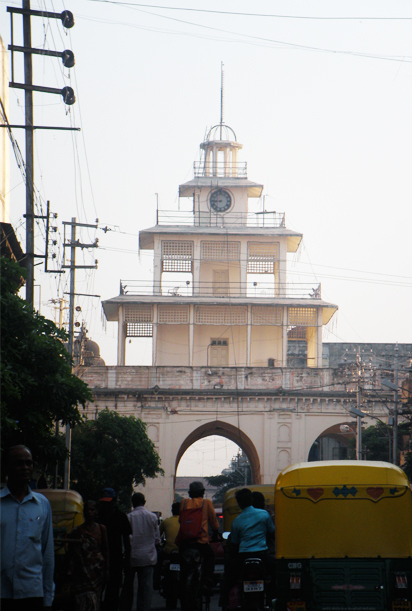 The architecture reflects the influence of the various rulers that once ruled Baroda from the Mughals to the Marathas. The buildings on the campus are moderate in scale, using local materials and surrounded by plenty of green space. The last ruler of Baroda; Maharaja Sayajirao Gaekwad played a great role in reforming and modernizing the city. He established libraries, universities, the textile and tile industry, a central park like park called Sayaji Baug or Kamati Baug that houses a zoo and museums. His plan was to build a city that was self-sufficient, an educational, industrial and commercial hub. I asked my friend tangy lemon as to what she felt about the growth rate of the city today as compared to other cities and she felt that the city unlike other cities in India was growing at a moderate scale. The city has not been spared by problems being faced by other cities at present in India but the city has been able to maintain it’s character; art and cultural centers are prominently interspersed within the city. The city is also at times referred to as the Sanskari Nagri (Cultural City) or the Garden City. and jewelry. The bazaar lead us to the center of the city known as Mandvi or the walled city. It is a walled city that is circular with four entrances in the north, east, south and west directions. In the center is a watch tower; a place to make important announcements and was used as a tax collection center. Most of the structures are wooden and were developed in a phased manner by the Gaekwad’s. The structures today are in need of restoration and repairs. After walking around in the heat we headed to Sarvodaya for some fresh homemade ice cream. I tried the sitafal (custard apple) ice cream and on tangy lemon’s insistence I also tried the mosambi badam (sweet lime and almond), at first I felt that it was a weird combination but it was actually quite refreshing. In western India and particularly in Gujarat; Navratri is celebrated with Garba, a folk dance. Garba means womb and it originates from the sanskrit word for gestation or pregnancy. Traditionally the dance is performed around a decorated clay pot or lantern that represents life, thus honouring Durga the feminine form of divinity. Men and women dressed in colourful embroidered costumes dance around the Garba in concentric rings. Garba was traditionally performed by women. Today in some places Garba is also performed with Dandiya Raas (garba played with sticks). In Vadodara however the traditional dance form is preferred and Raas is rarely seen. Where as in Ahemdabad Raas is popular. Garba is also popular amongst the youth in the US and UK. Tangy Lemon’s alma mater organizes Garba for students, alumni and their families. Here Garba is performed on traditional folk songs sung by students, faculty and folk singers from nearby villages are invited to be a part of the celebrations. The songs are performed without the use of a microphone to avoid noise pollution. The dance begins slowly and builds up towards the end – students that cannot keep up with the beat begin to recede towards the outer ring. Then we made our way to one of the two largest grounds where Garba is held and it is believed that there are about forty-five thousand people in attendance. One has to acquire passes to be able to dance or view the dance at this ground organized by United Way of Baroda. Here dancers are surrounded by a deep ring of viewers and then the viewers are surrounded by a ring of food stalls. Before we watched these passionate dancers we made our way to the food stalls and tried dabeli (a potato patty deep-fried and usually contains peanuts) which was served in a bun covered with sev (crisps) and was covered in a sweet and tangy sauce. I had to have dhokla (a snack made with fermented batter of chickpeas) with some garlic chutney and it was finger-licking good. The next day we began our day with a breakfast consisting of fafda (deep-fried chickpea flour flatbread) with green chilies and jalebis (deep fried sugary batter). It was a meal fit for a Maharaja. After breakfast we visited the Aurobindo Center. Sri Aurobindo had a strong presence in Baroda and was a scholar, a poet and a philosopher among other things. Gaekwad’s were big supporters of art and culture. The Fateh Singh Museum located in the sprawling Laxmi Vilas Palace Complex, houses the Gaekwad family’s collection of art and furniture. 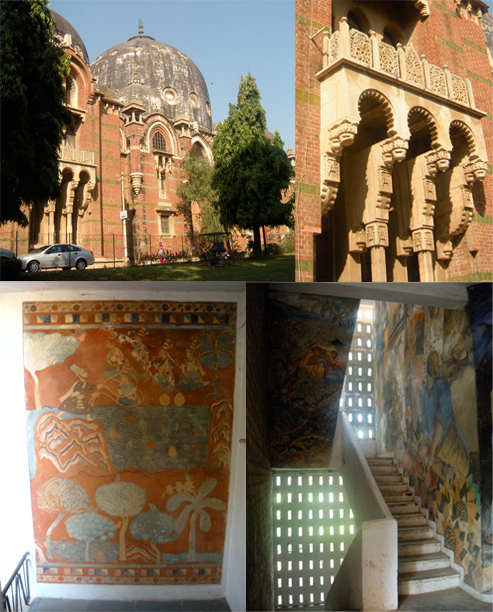 The collections include paintings and sculptures from Europe and a collection of paintings by Raja Ravi Varma. Varma painted portraits of the Gaekwad family and also scenes from the Ramayan and Mahabharata. His paintings had an influence of European Realism and characters were often painted in a revealing and compromising position. Our next stop was the EME temple, a Shiva temple run by the Indian army. The geodesic structure is enveloped in aluminium sheets and was built by the army. The architecture of the temple represents five main religions of India; the kalash atop the dome symbolizes Hinduism, the dome stands for Islam, the tower represents Christianity, the golden structure above the tower represents Buddhism and the entrance stands for Jainism. 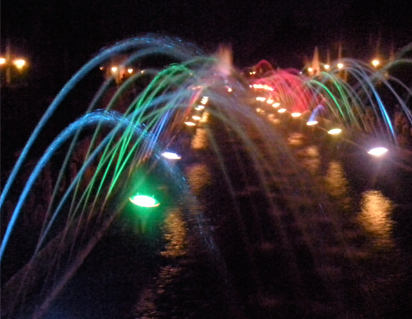 The evening ended with a visit to the Ajwa Park, it has terraced water fountains and gardens like the Brindavan Gardens in Mysore and a light and sound fountain show. A staff at the park appropriately referred to the fountain show as ‘disco fuwara’ (a dancing fountain) as the fountain danced to popular Bollywood tunes. It was time for some Garba again but after a long day we decided to go join the kiddie Garba. My friend Tangy Lemon and I were mistaken as young parents on the ground with our kids no where in sight. Vadodara is rich in culture and heritage, has a strong social infrastructure that consists of a number of museums, parks and cultural centers which makes it an attractive place for tourists and locals. The availability of skilled human resources and the existence of various industries augment commercialization. During this growth the city is consciously trying to retain it’s character and grow moderately as Sayajirao had dreamt. The city is growing sustainably or so it seems on the surface. This entry was posted in Art, Culture, Food, Indian Art and Architecture, Travel and tagged Architecture, art, Baroda, building, Culture, Festival, Food, Garba, growth, Heritage, Indian, Landmark, Navratri, Traditions, Travel, Vadodara. Bookmark the permalink. I’m so happy glad you were in baroda during garbas!!! You need to come back to motherland! Glad u liked Gujarat and Baroda specifically. Correction for the blog the dish having mashed potatoes with peanut stuff in the bread is called Dabeli and not Badeli. Ha! My bad. Yeah I knew that thanks for picking up on the typo. Will fix that. this post of your tickles too many of my navratri and gujju food memories!! I am glad:) When are you making a trip to India next?